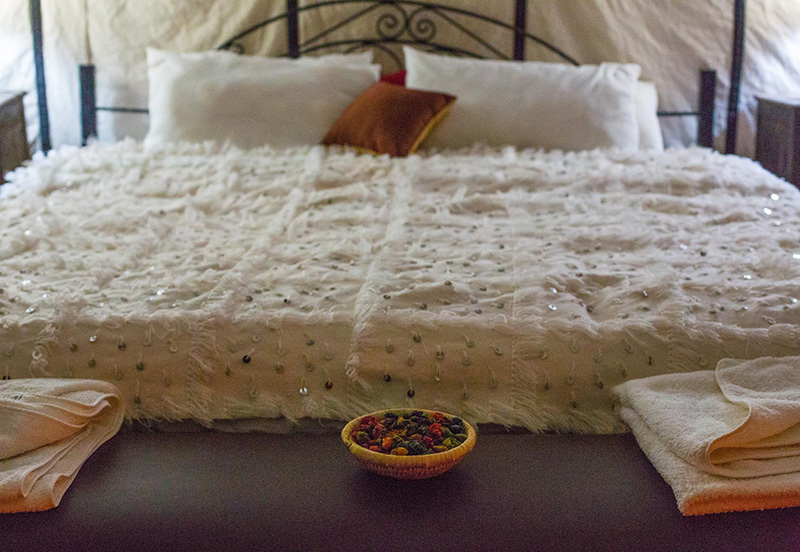 Luxury Desert Camp - Luxury Riad in Marrakech, Morocco. Book Luxury Desert Camp Today with Hip Marrakech - specialists in English Speaking Accommodation in Marrakesh, Morocco. ""The Merzouga Desert Luxury Camp offers visitor the chance to truly escape from the crowds of the cities."" 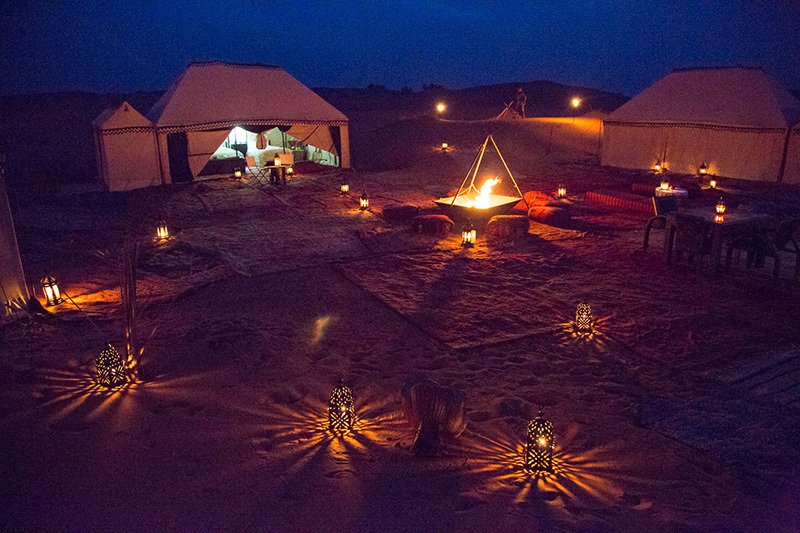 Set amidst the spectacular sand dunes of Erg Chebbi desert, The Merzouga Desert Luxury Camp offers visitor the chance to truly escape from the crowds of the cities and retreat from the stresses of the outside world. Aside from your guide and your fellow travellers, the only other people you may encounter during your stay are the native Berber Nomads that call this harsh yet beautiful environment home. 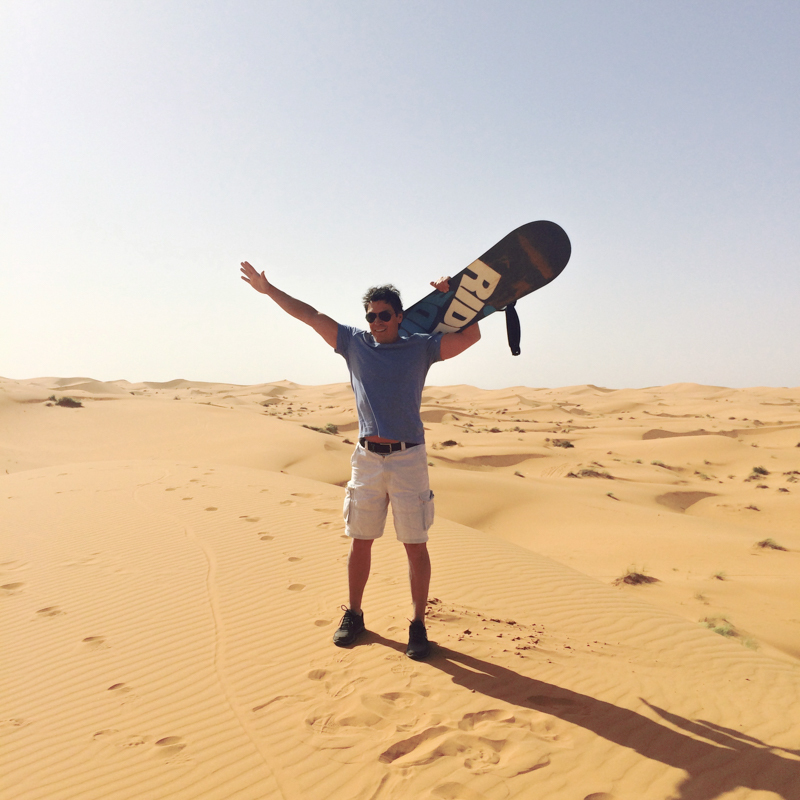 Indeed, the soft warm sands of the Erg Chebbi Desert is one of Morocco's most enchanting natural wonders. A more peaceful setting would be difficult to imagine, let alone find. The sand dunes encircling the site provide an utterly exquisite location for the camp and its stillness and purity are mirrored within. The main camp hosts 5 luxury desert sleeping tents. Fabricated with handcrafted furniture and soft textiles, each tent has been carefully designed to offer the highest comfort and luxury. The tents are very spacious, over 25sp m in size, and come complete with either a king-sized bed or two single beds and an en-suite bathroom facility with shower, flushing toilet, hand basin and running cold and hot water – quite a rarity in such a secluded location. 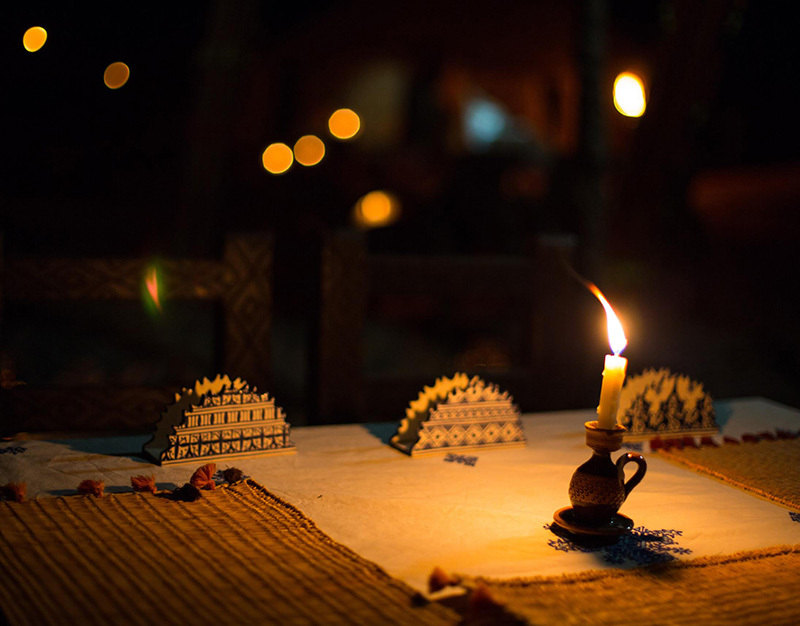 A tented restaurant offers Sumptuous Moroccan breakfast and traditional 3-course meals served at dinner. Iced cold beverages and fresh fruit and snacks are also served at any time in the day. Please note, alcohol is NOT sold in the camp, but you are welcome to bring your own with you. There are many places in the camp set for relaxation with fabulous views of the desert and sand dunes. When the night falls, the camps is lit up by a plethora of beautiful lanterns and the warm night air comes alive with storytelling and music. If you are looking for something beyond rejuvenation and relaxation, the Merzouga Desert Luxury Camp can also offer this. Included in your rate are a variety of activities, including camel trekking, sandboarding, visiting Nomads and looking for fossils. Visitors are welcome to participate in variety of activities from hiking to stargazing to cultural trips to the nearby villages. 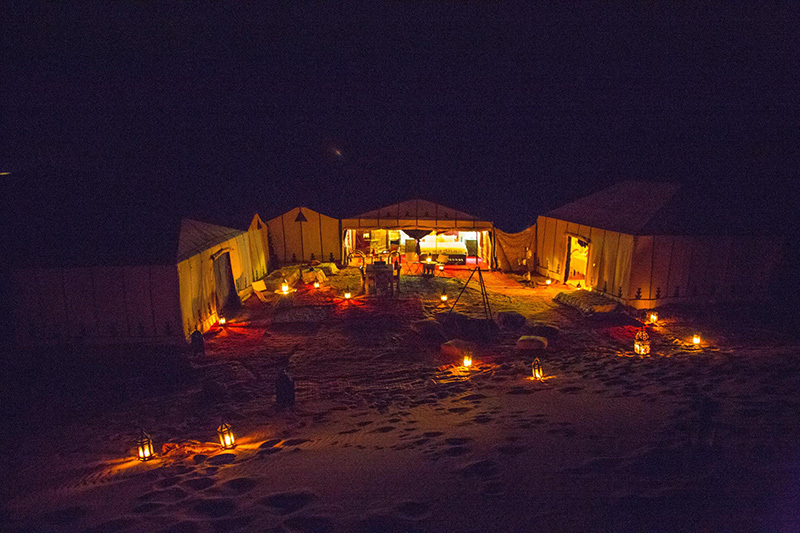 If spending a night in the desert was not already special enough, the unique luxury and seclusion of The Merzouga Desert Camp offers an experience that cannot be rivalled and memories that will last forever. Please note: We do welcome children of all ages to the Merzouga Desert Luxury Camp – Children 0 - 7 years old stay for free and Children 8 - 14 years old can stay for 50 Euros each. Please note: The camp is only reachable by 4x4 all terrain vehicle or camel trek. If clients would like to be collected by 4x4 (in case there are not coming in one already), a 600MAD fee is charged for the return transfer from Merzouga. Prices are based on 2 people sharing including breakfast, dinner, soft drinks and snacks, camel ride and extra activities. The main camp hosts 5 luxury desert sleeping tents, fitted with either a king sized bed or two single beds to your needs. 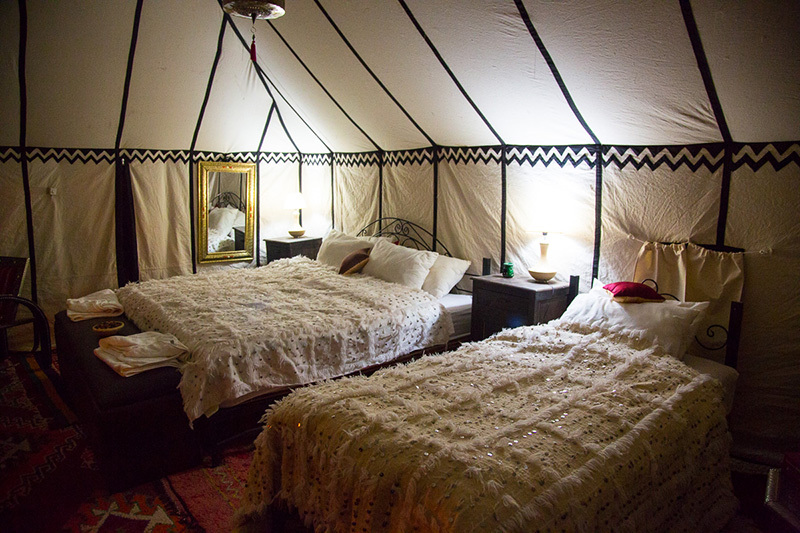 Each tent is carpeted and comes fitted furnished with full-length mirror, an ottoman seat, an armchairs and table of course, all the furniture has been handmade by traditionally trained artisans in Morocco. Each tent also comes equipped with a private en-suite bathroom, complete with shower, flushing toilet and hand basin and running cold and hot water – quite a rarity in such a secluded location. Room features: En-suite bathroom and shower room, unique traditional furnishings. A range of activities and meals, drinks and snacks are also included in the rate. 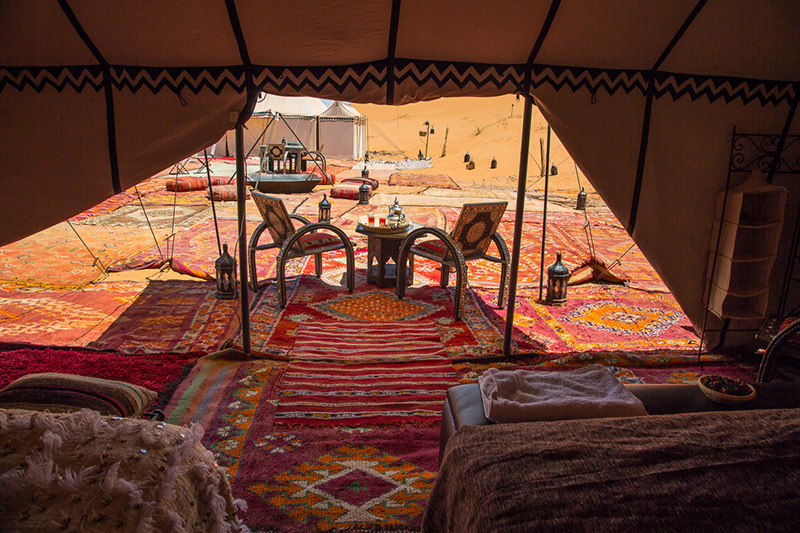 The base rate price at Luxury Desert Camp is in pounds, euros, or Moroccan dirhams and exchange rates are approximate. Lunch: Your midday meal is available on request with a variety of light options including child friendly meals. This is offered to guests staying 2 nights or more. Snacks and Drinks: Iced cold beverages and fresh fruit and snacks are also served at any time in the day, this is also included in your rate. Alcohol: Please note, alcohol is NOT sold in the camp, but you are welcome to bring your own with you. 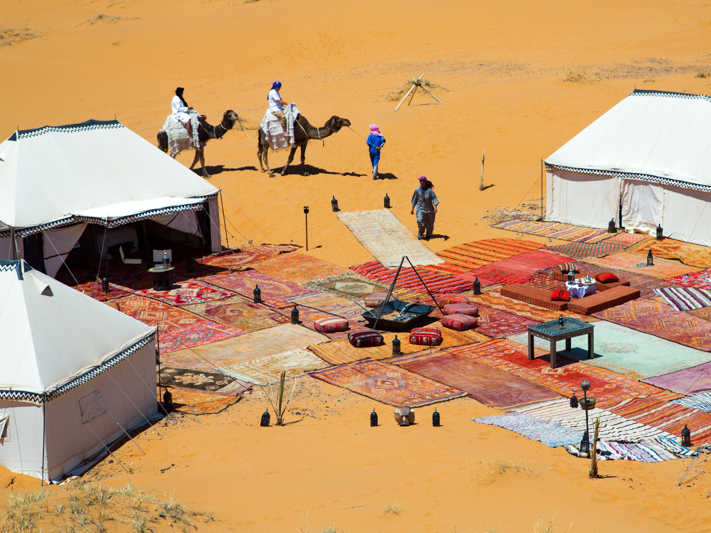 Although The Merzouga Desert Luxury Camp is predominantly a space of rejuvenation and relaxation, these is also a huge range of activities and excursions on offer. Included in your rate are a variety of activities, including camel trekking, sandboarding, visiting Nomads and looking for fossils. Visitors are welcome to participate in variety of activities from hiking to stargazing to cultural trips to the nearby villages. 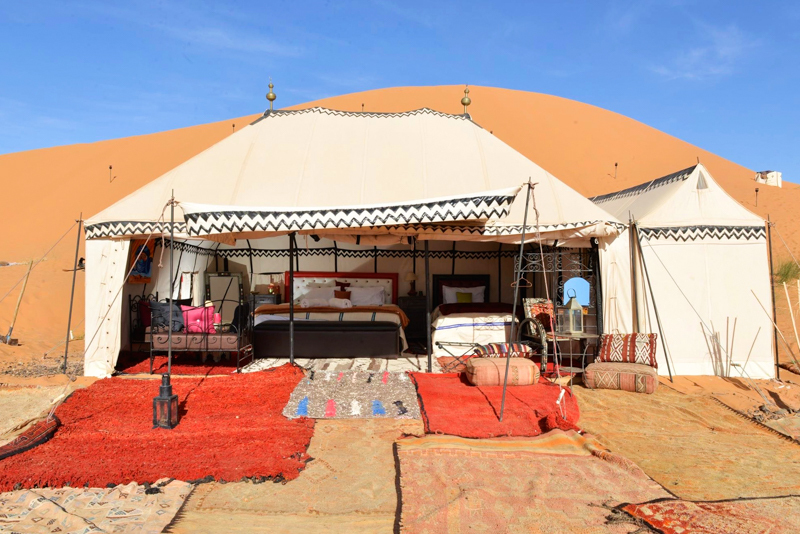 Set amidst the spectacular sand dunes of Erg Chebbi desert near to the small village of Merzouga, The Merzouga Desert Luxury Camp offers visitor the chance to truly escape from the crowds of the cities and retreat from the stresses of the outside world. Best Price Guaranteed! All prices match or are lower than those charged directly by Luxury Desert Camp. We can check availability at Luxury Desert Camp for you, process your booking and assist you in finding alternative dates and accommodation if your first choice is already taken. Every member of our team has expert knowledge of each riad including Luxury Desert Camp and can provide more information about the rooms, the location and how well suited it is to your specific requirements.